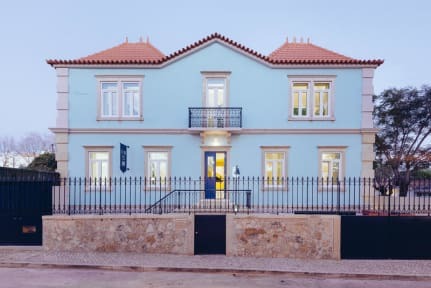 Get Inn Hostel i Cascais, Portugal: Reservér nu! Group bookings can be cancelled free of charge up till 1 week prior to arrival date. Bookings cancelled witith 1 week of arrival date will be charged for the first night of stay. It is agreed that the guest will conduct him/herself in a respectable manner and will not cause any nuisance or annoyance within the hotel premise. Get Inn Hostel greet the day with a delicious buffet breakfast (NOT INCLUDED) in our fully equipped kitchen, meet fellow travelers on our recreational area (with a flat screen tv, videogames, board games and other surprises) and embark on new adventures. Our terrace is the perfect place for coffee and a book or a summertime barbecue. Our staff will be there for you 24/7. If you’re a surf lover Get Inn has a place for you to store and wash your equipment. The Get Inn Hostel is in Parede, within walking distance of the beach and near Cascais and Estoril. Be it for the waves, the nightlife or the amazing natural surroundings, the region will surprise you with its buzz and year-round events. Explore it! 30 min. from Lisbon. 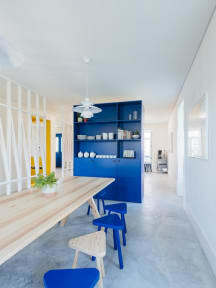 Get Inn Hostel rooms are named after local beaches and inspired by their simplicity and beauty. Bathed in natural light and comprised of high-end bunk beds, all rooms are made for comfortable memories and warm wake-ups. Each bed has its own locker, curtains, reading light and socket. We hereby inform you that from 01.01.2016 the city of Lisbon will begin to charge a City Tax of 1 euro per person, value which will not be included in the informed prices and in the total price of your reservation. This tax will be charged directly to the guest at the hotel. Tax value is 1 euro per person per night for a maximum of 7 nights stay.